Rockstar Energy Suzuki World MXGP’s Kevin Strijbos could not ascend the podium at Lommel for his home Grand Prix and the 15th round of 17 in the FIM Motocross World Championship but the Belgian did acquire 29 points for fifth position overall to move up to third place in the premier class standings. Strijbos might know Lommel intimately but that didn't mean that the deep sand was any easier to traverse. The bumps and holes were heavy-going and combined with hot weather and a freak thunderstorm at the end of the second moto then conditions were not a ‘breeze’ for him and the Rockstar Suzuki crew in front of 21,000 spectators. 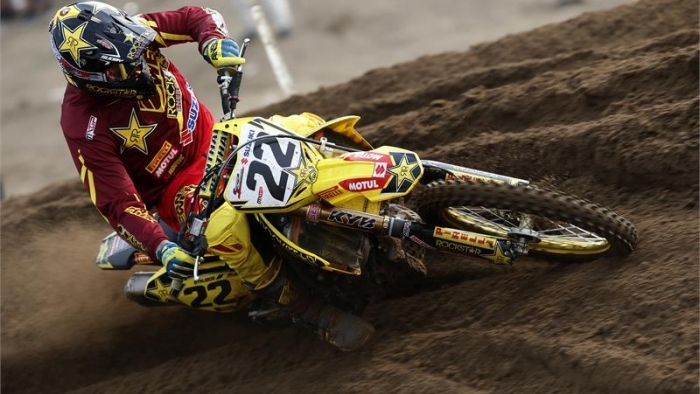 Strijbos made a flying start in the first moto. He shadowed World Champion Antonio Cairoli and then passed the Sicilian to lead for four of the 18 laps. The Belgian didn't quite have the rhythm and flow to maintain the pace until the flag and was soon under attack from pursuers. Strijbos dropped back to fifth and was unable to defend a top-four finish from countryman Ken De Dycker. In the second moto Strijbos still lacked the power to ‘go’. His start was slightly worse and although it seemed he was biding his time from a top-10 position he was soon frustrated by not being able to make any ground. He crossed the line in eighth spot. Clement Desalle was in attendance engaging in some promotional activity for Fox and commented that his broken scaphoid will be examined and evaluated this week and he might have to consider surgery to fix the problem. Strijbos demoted the Belgian to fourth in the series by 14 points. Rockstar Energy Suzuki World MXGP will shut down their Grand Prix activities throughout the month of August, as the penultimate round of the championship will take place at Trindade for the Grand Prix State of Goias in Brazil on September 7th.